Over 20 years ago, rail yards and abandoned warehouses filled this rundown area in Portland, Ore. Today, the Pearl District is an attraction with art galleries, restaurants, upscale businesses and residences. Photo provided by Michele E. Reeves. Mixed-use districts do not mirror arterial-style development. Mixed-use districts are people focused. Arterial-style development is automobile centered. A mixed-use district does not have the land, or the parking infrastructure, to compete with arterial form. If you wield a typical suburban toolkit to originate, or renew, a mixed-use district, you will create an in-between place—something that is not quite a downtown, and not quite a mall or lifestyle center. And, most importantly, you will have fashioned a place that is economically underperforming because it won’t be leveraging the strengths found in denser, more varied districts. First and foremost, mixed-use achieves vibrancy and economic success by being great places for people. Why is the people scale so critical? Because economic success is indelibly linked to foot traffic. Unlike a strip mall, where people drive to each store to shop, a mixed-use district requires high foot traffic counts to generate high sales per square foot for retail tenants. In fact, it is this pedestrian cross-pollination between businesses that creates an overall experience that exceeds the impact that just one establishment can provide. Since top performing downtowns and centers are so economically dependent upon walkers, every design decision must be made with the pedestrian in mind, promoting engagement for people on foot throughout the district. Engaging ground floor: The Rebuilding Center sells deconstructed building parts in Portland, Ore. The company contributes to the pedestrian-friendly environment with a bioswale between the building and the sidewalk, cordoned off by a beautiful handrail, containing objects from the store, and public benches. Photo provided by Michele E. Reeves. After embracing these two key concepts, you next want to consider what builds identity and drives activity in places. Mixed-use districts derive their identity from ground floor tenants. Upstairs stakeholders—dentists, lawyers, massage therapists, and residents—are important to the district, but don’t impact identity to the degree that street level businesses do. Bottom line: What is on the ground floor matters! Ground floor retailers and restaurants are the lifeblood of a mixed-use district. They provide the social activities that draw people onto the sidewalks, and they are the engines that create a multi-sensory experience, both of which we expect in a thriving place. As much as possible, these uses should be clustered together to achieve maximum animation, which, in turn, attracts more residents and professional office users. Eventually, the goal is to interconnect these activators so they create an uninterrupted dialog along the sidewalk. This continuity is critical because walkers will not amble past any sort of blank (parking lot, parking garage, an inward-facing business, etc.). Therefore, a district must offer a consistently engaging ground floor experience to create an economically sustainable place. Take the Rebuilding Center in Portland, Ore., as an example. It is a 50,000+ SF warehouse selling deconstructed building and house parts—essentially a used Home Depot. This industrial non-profit is located on a pedestrian-friendly mixed-use street, and it contributes substantially to the street environment. How? By incorporating their story and their mission into their building. The Rebuilding Center pieced together reclaimed lumber, and a patchwork of century-old and modern windows, to construct the walls that comprise their largest warehouse area. Then, they built a small bioswale between part of the building and the sidewalk, cordoned off by a handrail that is nothing short of metal art, containing found objects collected from the store. And, along the retail corridor, they recessed into the walls several beautiful curved benches, which are open to the public and are adorned with stylized trees with sculpted branches that fan out overhead. Neighborhood residents helped to construct it, and decorated the tree branches with personal objects that were meaningful to them in some way. All ground floor businesses should contribute to, and participate in a dialog with passersby at the street level. And, all ground floor business can contribute to this street dialog, as the Rebuilding Center demonstrates. Forget signs. 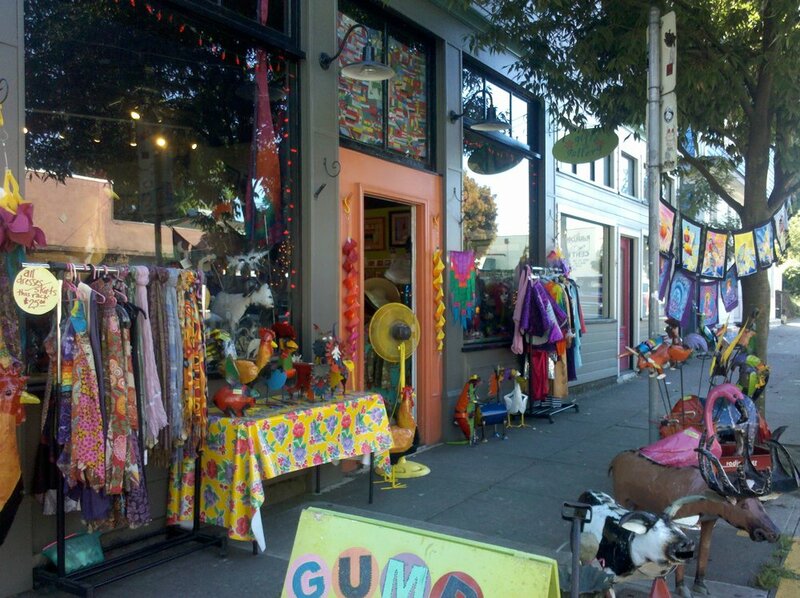 A great storefront will capture someone’s attention through window displays and exterior merchandise much as the store did in the photo above. Moreover, fantastic stores are visually appealing, well-stocked, and dramatically lit. This retail shop, pictured below, provides delightful discoveries to those passing by. Photos provided by Michele E. Reeves. The following are the typical conditions present in a district that is really starting to hit its stride. Seeing the area with fresh eyes: Very often in places that undergo positive change, there has been a wave of new property owners, businesses, or residents to the area. This surge does not necessarily bring more capital to the table, but it does bring fresh eyes. In other words, folks with no historical baggage. They don’t look at a building and say, “That used to be the J.C. Penney’s store, I remember when they left downtown for the mall in 1978.” Instead, they say, “Hey, that’s a cool old building, I wonder if we could fix it up and turn it into a coffee shop.” To improve a mixed-use district, stakeholders must begin looking toward a place’s future potential, not its declining past. Developing nodes of activity: Hotspots with hustle and bustle are how retail districts grow, and are a sign of economic improvement. A common hotspot might be several destination restaurants bunched together. Eventually, retailers will want to colonize the borders of such a node, to be near the patrons frequenting the food establishments. Forming an identity: Places that are economically successful have a strong identity, or layers of identity. Themes that might resonate with visitors and residents could be food, entertainment, do-it-yourself, art, music, culture, or any combination of the above. Having a critical mass of buildings redeveloped/constructed: This speaks for itself. If a place looks nice, people will want to be there. If a district’s infrastructure and businesses are neglected and tired, then it tells the story of a place that is neglected and tired. And, the people who reside, visit and work in this place will feel neglected and tired, which are not emotions that create vitality, or encourage people to spend money. It has got to look and feel good to be successful.  Interior merchandising: Being a great retailer doesn’t require expensive fixtures and space that is tricked out in zillion dollar finishes. Fantastic stores are at once, easy-to-navigate, while also providing a delightful discovery around each bend. They are visually appealing, well-stocked, and dramatically lit.  Window displays: Forget signs. People should be able to understand what a store sells, and get a sense of the experience that it provides, just by looking at its storefront for a few seconds, because that is all the time it will get to capture someone’s attention. Good retailers tell complex stories in a matter of moments by using exterior building color, exterior merchandise and props, architectural features, window displays, and again, great lighting. Working together: Revitalization always comes from people. The only way to improve a place is to have stakeholders work together to bring visitors to the district, and then create wonderful community fabric and experiences for them to enjoy when they are there. Renewal cannot happen without relationships and leadership within the community. Physically connected: The goal is to have no blanks in either infrastructure or outward facing uses, so that the district itself becomes the destination, instead of a specific store or business. Enchanting exteriors: Americans are starved for a scale of interaction that is pedestrian-friendly and attractive, even in the middle of the suburbs. But it’s not enough to get just the scale right. Every district is competing for people’s time, and visitors want to feel that they are somewhere special, which requires visual stimulation and pleasure. Absorbing interiors: Just as a place is competing for people’s time on a district-wide level, on a smaller scale, on the local entrepreneurial scale, businesses are competing with malls and slick international retail operators. To win customers, merchants must offer unique spaces, superior service, and exceptional expertise. As you revitalize a mixed-use district or build it from scratch, think of buildings as sets and sidewalks as the stage upon which you tell your district’s story. The goal is to lure people to the district by offering a compelling and unique experience. If you are successful, you will bring foot traffic, economic viability, positive civic identity, and droves of new consumers, residents, and businesses that want to live, work, and/or play in your new and improved district. Michele E. Reeves founded Civilis Consultants to assist mixed-use districts and large public sector organizations to recognize and leverage their strengths, accomplish economic development goals, and craft their unique stories to create compelling, multi-faceted brands. Visit civilisconsultants.com.